Add 2 1/2 + 1 1/3. Subtract 2 1/14 - 1 1/7. How many rows of carrots and onions are in the garden? How many rows of tomatoes and squash are in the garden? How many rows of onions, peas and squash are in the garden? 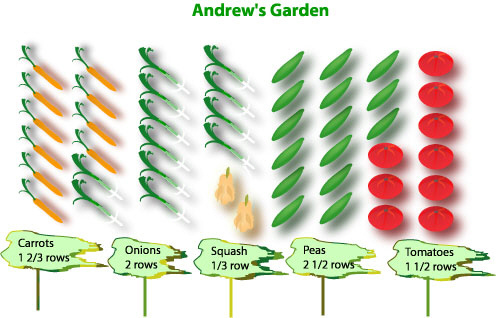 How many rows of carrots, peas and tomatoes are in the garden? How many rows of carrots and peas are in the garden? Yesterday Niall ran 3 7/8 km. Today he ran 2 1/4 km. How much further did he run yesterday than today? Phoebe drove 16 3/4 km from home to the library. She took the same route back but stopped at a newspaper kiosk 4 1/2 km from the library. If she takes the same route back home, how far is she from her home?